Pongal is a four day-long celebration held in Tamil Nadu. This festival is usually celebrated in the January to February time span. The Pongal festival is a form of harvest festival and is a way of the people of Tamil Nadu to say thanks to nature for helping their harvest to grow. The name ‘Pongal’ means ‘to boil’ and marks the season when rice, sugar cane, and other cereals are harvested. It is a festival of prosperity and is celebrated grandly in the state. The occasion is celebrated with many pujas; the women draw kolams at the entrance of the house and many contests and feasts are organized. 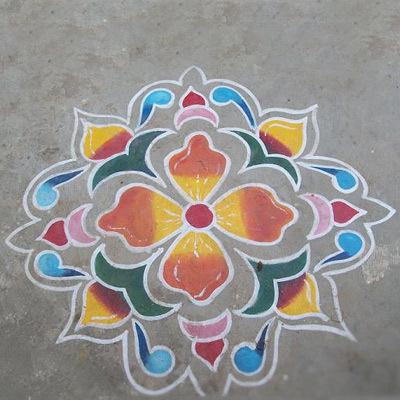 Kolam, or a special type of rangoli seen in South India, is done throughout the year in most homes. 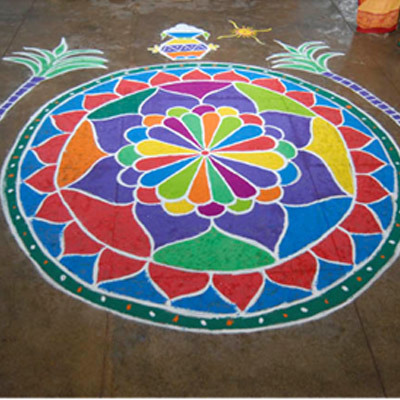 But during Pongal all houses, offices and lanes are adorned in colorful kolam. 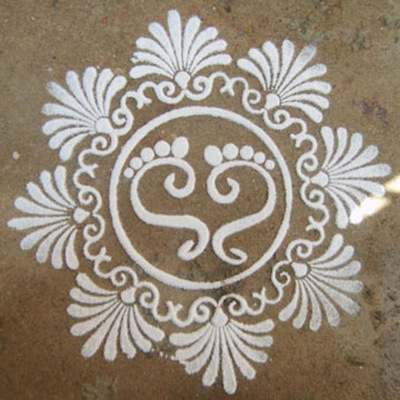 Kolam-making might look a tough job but with some practice, anyone can get better at this. 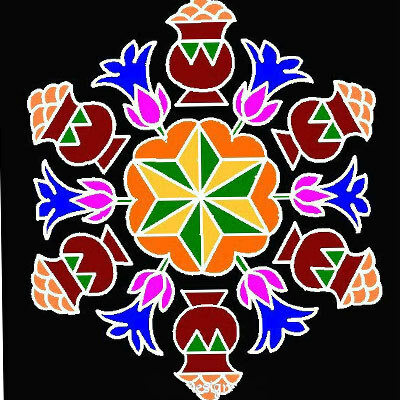 The colors used in Pongal are usually powdered and the use of fingers to draw the pongal kolam designs is an essential part. 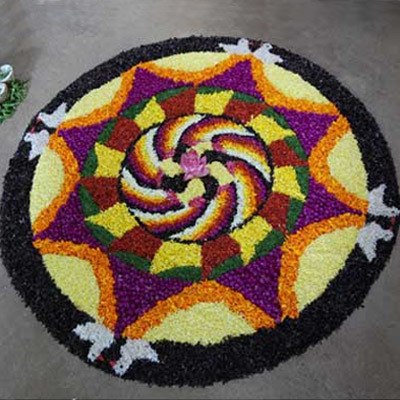 Also, flower petals and leaves are used for making kolams. The flower petals of different colors are used in making the designs. Sometimes colored powder is also used along with flowers. There are innumerable designs which speak for the festive season, but you may be overwhelmed with them. 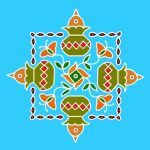 So as we know how much you guys love colorful and unique Pongal kolam designs, we are back with some really unique and easy-to-do kolam designs. This beautiful and simple Pongal kolam is symmetrical as most kolams are based on symmetrical designs or mirror designs. The main feature of these kolams is that if they are divided into two equal parts horizontally or vertically, they will be the same on each side. Here the flower and vessel with brewing sweets is really important. The brewing sweet pot is symbolic of prosperity along with the flowers and butterflies. 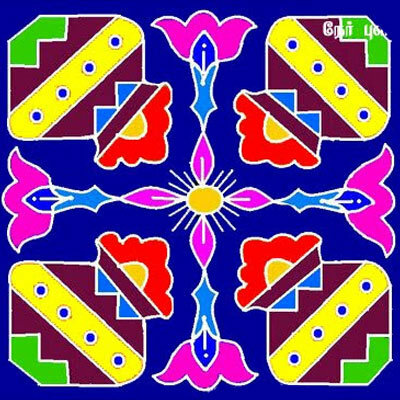 This beautiful rangoli uses quite a bit of vibrant colors. The blue, orange, yellow and green are great for creating the contrast. The brewing pots of sweets and the floral motifs make it really apt for the festive season as well as easy to make. The design looks simple yet there is a modern touch in it too. 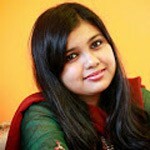 The green background may be changed as per your requirement. Each corner holds a small flower pot which holds a flower that extends into the rangoli design. The design looks quite unique and attractive. 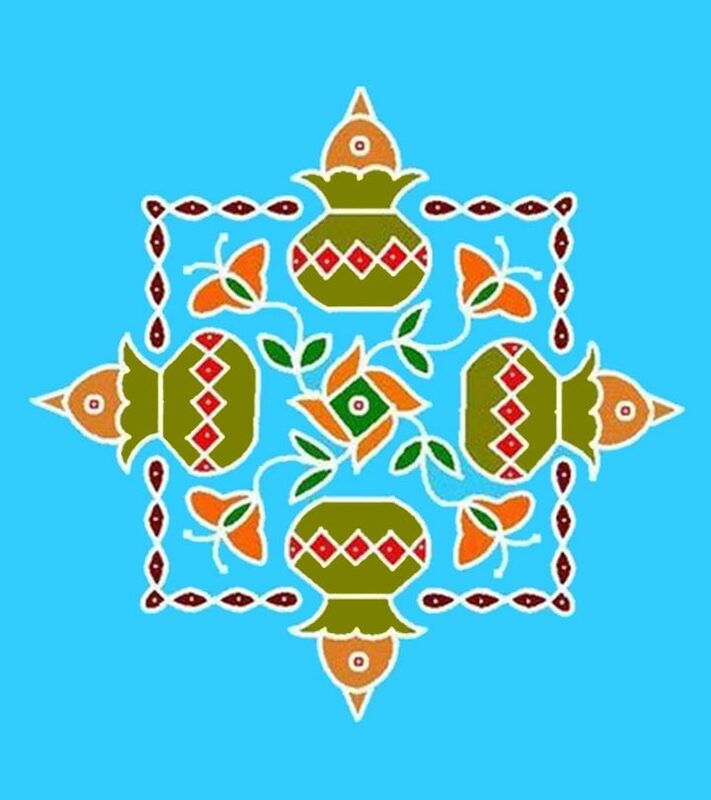 This bright blue background rangoli is done using all vibrant colors which also complement each other like blue, green, yellow as well as colors which are a bit shabby like grays and maroon. The design is easy enough and will look perfect for Pongal. 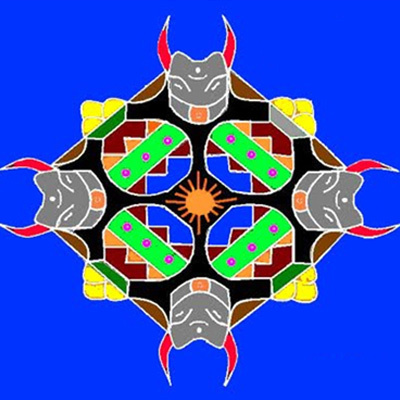 Four ox heads are facing inward and there is a design of the Sun in the middle. The brewing pots are facing outwards. Here the striking combination is of black and yellow, and blue with green and orange. Purple is also present in the design. The diya design is quite nice and the usual brewing pot of sweets is also present. The brewing pot is the symbol of prosperity and hence it is so much common in these Rangolis. It is done with blue, green, orange and yellow. This pongal kolam design features six brewing sweet pots, drawn forming a circular design. The bright red, blue, maroon and white as well as the yellow make for a good contrast. The centre shows a bright yellow flower done over a red backdrop. The interesting choice of colors makes it perfect for any home and occasion. It’s bright and will attract everyone’s attention easily. 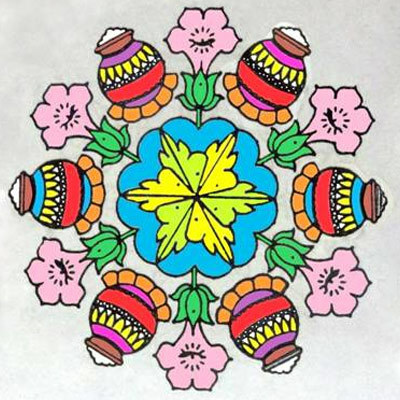 This design shows paper cuttings of the Pongal brewing sweets pot and small diya stands being used to make this rangoli. The paper cutouts used to make this design can be replaced by flower petals or colored rice powder as per your choice. What we love is that it is easy to do even for kids .These paper cuttings may be used as practice tools too. White paper may be replaced with colored paper or any material you like. Colors suggest the jovial festive mood and this kind of Pongal pot kolam designs look very festive-appropriate. The Pongal sweets pot and the lotus flower surely bring out the essence of the Pongal festival. The brewing pots are six in number and are positioned to a circle and the lotus flowers are placed around them. The colors used are quite bold and catch the eye. Using bold colors makes them more attractive but one can change these colors to suit their needs. A neutral background will serve the best like grey or white. This one is a hexagon-shaped rangoli. 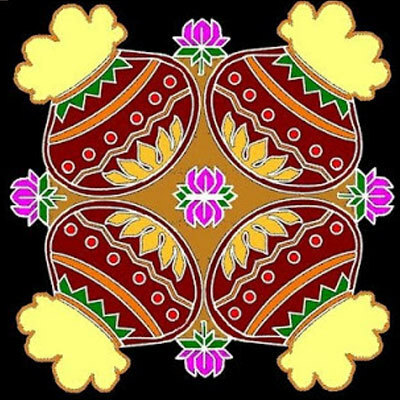 This shape is quite unique for a Pongal rangoli. The brewing sweet pot and the lotus are common in here but the colors used are quite bright and look beautiful on the black background. This design looks unique with a cube within a cube design. 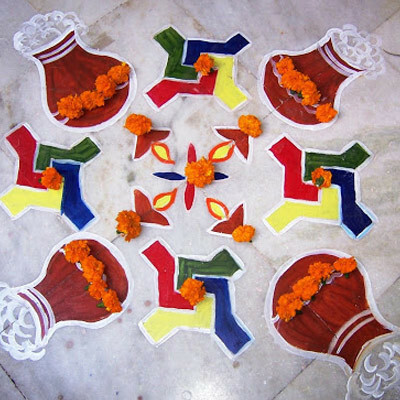 The brewing sweet pot is seen on four sides of the rangoli. 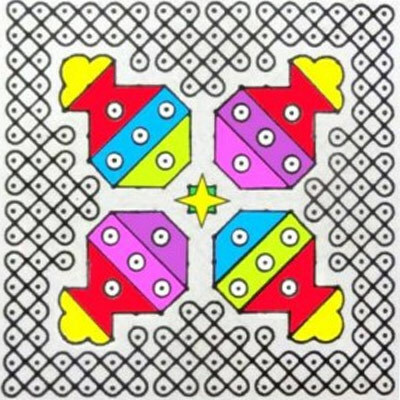 The centre shows a floral motif with each corner turning into a butterfly design. The colors used here look quite less bold than the rest of the designs presented here. The colors used are olive green, orange, saffron, red etc .The black background helps to make the design more prominent. 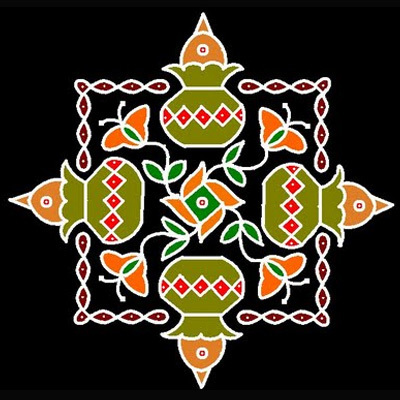 The black background of this design makes it a great kolam to look at. The green-saffron contrast seems great and the design is based on the usual Pongal sweet pot. The design is of a cube-within-a-cube format. The border using the saffron and white, and the kolam sweet pots are done using green color. The saffron color is used for the color of the sweets. The centre shows a flower and leaves which spread towards the corners and form into butterflies in the end. 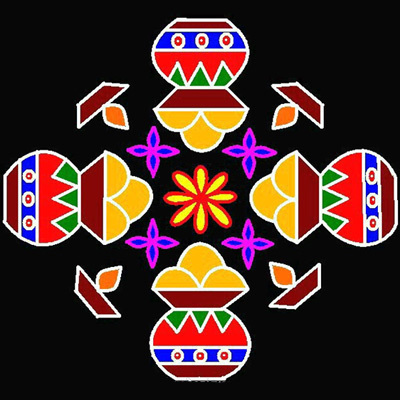 The design here in the center is the common Pongal design of the sweet pot but surrounding it we see many pulli kolam designs. 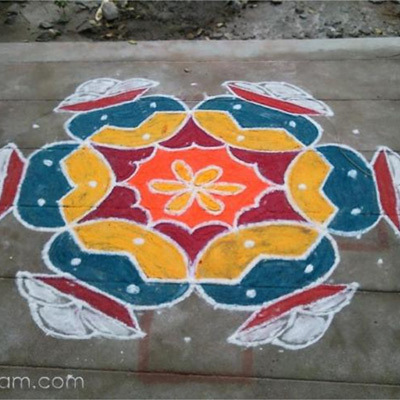 This kind of pongal kolam designs with dots is used to make the spiral design surrounding the kolam. The sweet pots are done with vibrant colors which make them look quite different. The colors used for the design alternate within the sequence of the design. Four sweet pots are used here in this design, facing away from each other. The lotus flower, also a sign of prosperity, is used in the center and in between the pots. The design is simple yet presents the essence of Pongal beautifully. The colors used here are sober and common like pink, green, yellow, black and red. Here we see a circular kolam design. There is one sugarcane design on either side of the kolam design. The colors used here are quite striking and bright. The design is floral and geometrical. 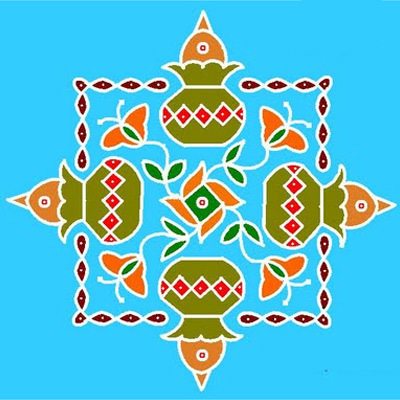 The design requires expertise in kolam-making. At the top of the design, there is a pot full of the Pongal sweets. This one is quite simple to do. The use of flowers as well as colors makes this quite different. The basic design has been done with colors. Marigold flowers are then used to highlight certain areas. The designs in between the sweet pot designs are done with four colored symbols. The design requires a white or light colored backdrop. The floor seems the perfect background for the marigold flowers. Here the Pongal sweet pots are filled in with geometric alternate patterns and colors. The colors are quite striking. Pink, violet, red, yellow, orange and green come together in this Pongal design. The red backdrop also creates a contrasting effect on the design. The design here is mainly based on geometric shapes. This design is fairly simple and it is only done using white colored powder. This design is in the circular shape. The floral designs are done around the circle and the centre holds the design of the footprints of the Goddess of Prosperity -Laxmi. The Goddess Laxmi is believed to be the one who provides humans with ‘Dhan’ or Money. The Goddess blesses humans with good crops and the way to earn one’s livelihood. The design is a simple yet great way to celebrate the blessings of Laxmi upon you. So these were the top 16 Pongal kolam designs for you to try in 2019. 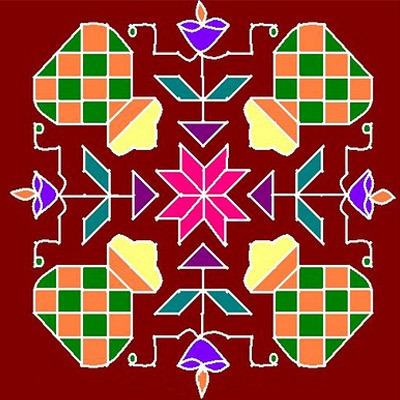 Do try different colors and ingredients to make your rangoli. We surely hope you will be ready for our next collection. Let us know your thoughts below.